Growing up, I had a peanut butter and jelly sandwich almost every day for lunch. It was always the same: smooth peanut butter, grape jelly, and sourdough bread. Even though I don’t eat a pb&j every day for lunch now (sad), it’s still one of my all time favorite sandwich combos. So when the team at Peanut Butter and Co. challenged us to start a #PBJrevolution, I decided to get a little fancy and made peanut butter and jelly crepes. Whenever I’m out for brunch I always think to order crepes just because they sound so much fancier than a plain ol’ pancake or piece of toast. And while crepes require minimal ingredients, I never think to make them at home. And then I received a shipment of these beauties. My Peanut Butter and Co. treats included Old Fashioned Crunchy, Smooth Operator, Seriously Strawberry Jam and Gorgeous Grape Jelly. 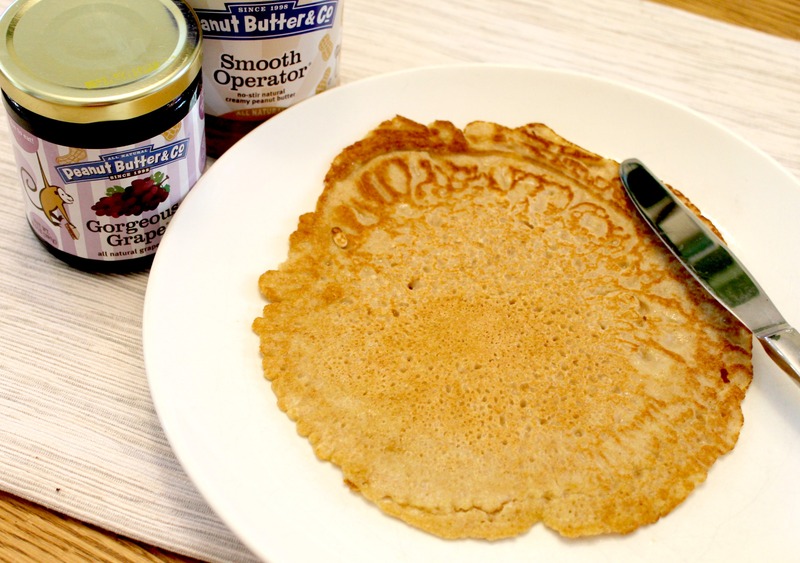 These ingredients were just begging to be made into a crepe, and thus peanut butter and jelly crepes was born. I used spelt flour as the base for my crepes which was a nice change of pace from traditional wheat, and used honey in place of granulated sugar. And let me tell you, there is nothing better than a spread of peanut butter and jelly on a warm, fresh crepe. 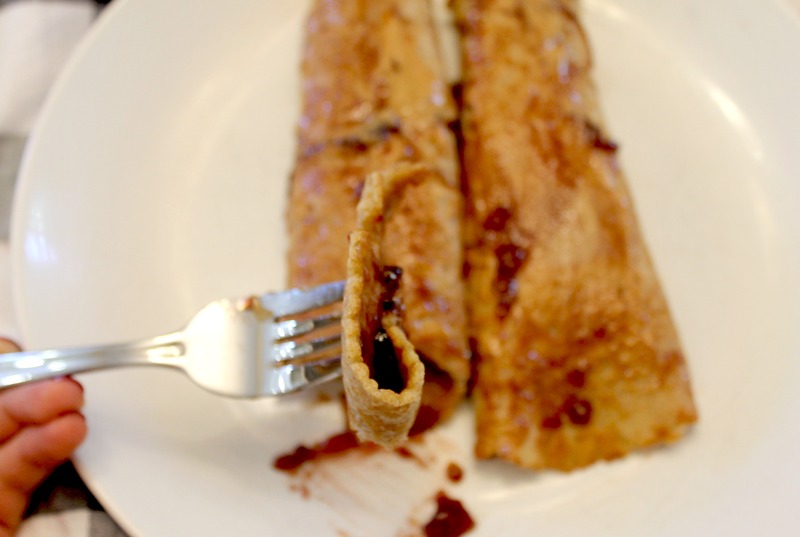 I recommend making a big batch of crepes and then heating them up on mornings you are just feeling a little fancy, or just have a hankering for a nice pb&j. You won’t be disappointed! Interested in starting your own #PBJrevolution? Be sure to check the GIVEAWAY at the bottom of this post! In a large mixing bowl add all of your ingredients and mix until well blended. The crepe batter should be relatively thin. Heat up a crepe pan or griddle pan on the stove and use some oil to coat the skillet. 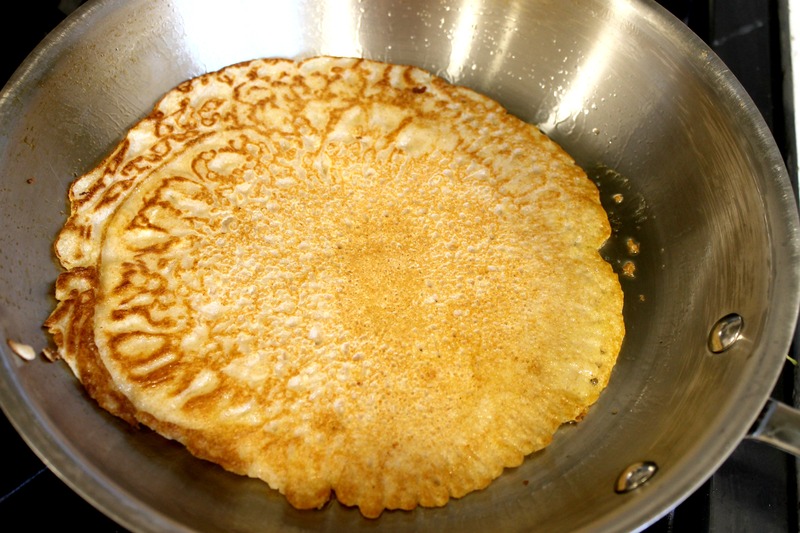 Gently ladle your crepe mixture into the skillet and swirl around the pan until the skillet is coated. Let your crepe cook for 1-2 minutes and then flip and cook for another 30-45 seconds. Remove your crepe from the pan and place on a plate. Add a layer of peanut butter. Then add your jelly – the more jelly the better! Roll up your crepe and add more pb&j if you so choose. Now to the fun stuff. A giveaway! One lucky winner will receive a prize pack with Old Fashioned Crunchy, Smooth Operator, Gorgeous Grape Jelly and Seriously Strawberry Jam. You can enter through the rafflecopter widget below. Open to U.S. Residents only. Thanks Peanut Butter and Co. for sponsoring this giveaway! What’s your favorite way to make pb&j? 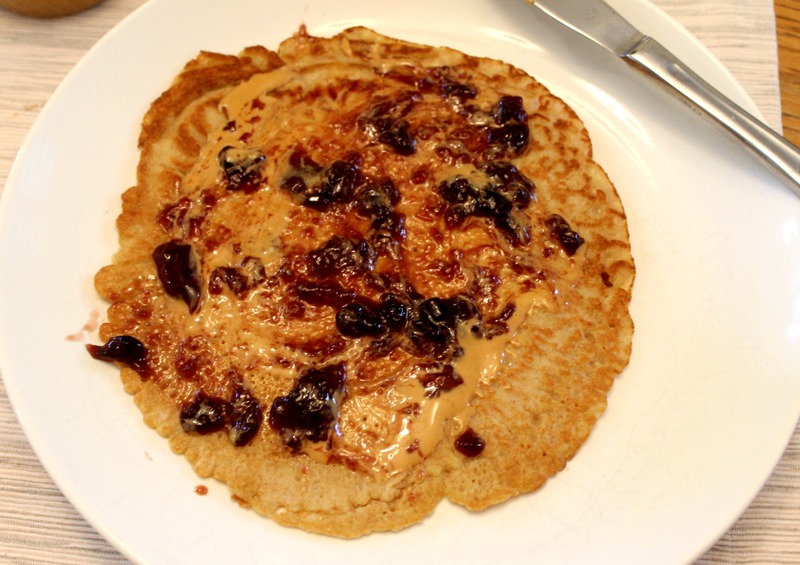 This entry was posted in Cooking, Food Bloggers, Giveaway and tagged peanut butter, snack on August 28, 2014 by allie@sweetpotatobites. OMG delicious! 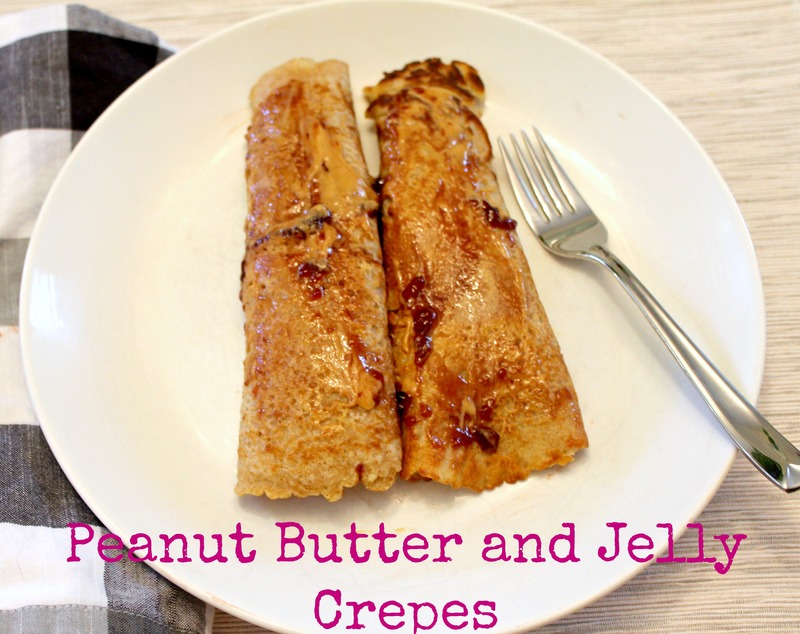 Crepes are always delicious and you pretty much can’t beat the awesomeness of PB&J! Just a good old fashioned pb&j! On a spoon or topping ice cream!! My favorite way to eat PB&J is in a Pocket Thin! My favorite way to eat peanut butter is on a traditional pb&j sandwich. I have to be honest, there is nothing better than peanut butter and grape jam on white bread! 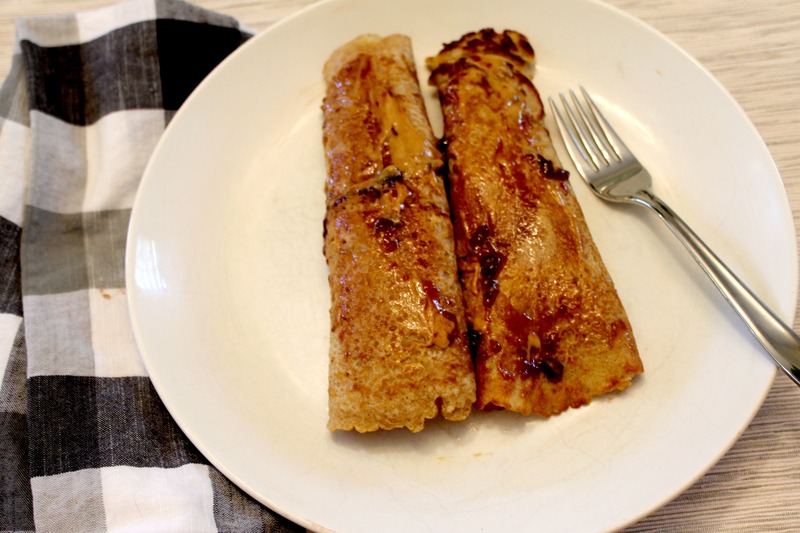 I love crepes and they are so easy to make! Never thought of a P & J Crepe…thank you for the recipe! On homemade cinnamon raisin bread. I’m fairly traditional when it comes to PB & J. I like the peanut butter spread on both pieces of a hearty, nutty wheat bread with a thin layer of jam. My favorite part of the bread is the heel, to bad there\’s only two in each loaf! I really like to make a grilled peanut butter and jelly sandwich. I mainly have my peanut butter on an English muffin, but I also love it on celery. With some vanilla ice cream. I like it rolled up in a tortilla, but now rolled up in a warm crepe sounds good! I love peanut butter spread on a graham cracker and drizzled with honey. Since we don’t eat wheat, we love PB&J on apple slices. I love pb&j on whole grain toast! On nice, warm, whole wheat toast. I like eating PB&J on crackers! Sliced apples with pb&j spread on top are always a treat! My favorite way to eat pb&j is with very toasted bread, and overflowing with bee’s knees peanut butter. I’d eat PB in just abut any capicity. Plain, on bread, on cereal…. you name it! My favorite way to eat peanut butter and jelly is to make a grilled PB & J.
I just love eating PB on a spoon. I like it on whole grain bread with a side of potato chips.